“Conjunto” music of the Mexican-American communities of Southern Texas is a not just form of entertainment and a conjunto gathering not just a lighthearted excuse to dance. The term conjunto, which in Spanish means “set” or “group,” refers both to the coming-together of a diversity of musical influences from Mexico and Southern Texas to form a musically distinct and culturally unique Mexican-American genre, but also to the group of musicians that band together to create that music. Conjuntos are community events that allow Texan Mexicans the ability to celebrate their history and culture. Conjuntos are also bands that play all the good old dances–Mexican, German, and more–to playfully, yet powerfully, channel the past. “Conjunto” is a mix of influences and styles, all present in South Texas in the late 1800s, that fused to form a genre that is at the same time uniquely Mexican and also a unique product of the American southwest. Though Texas had left Mexican control to become part of the U.S. in the mid-1840, Mexican music, culture and the Spanish language still dominated the region. There may have been a drawn border between Mexico and the States, but people and their culture still flowed freely between the two. Texan/Mexican musicians quickly recognized the accordion as an instruments with enough of a presence to become the focal point of a raucous dance band. [Check out a demonstration of the button accordion and see if you agree.] By the turn of the century other instruments had joined the accordion, such as the tololche, or Mexican bass (you can see one in action as part of this ensemble), and more specifically, the “bajo sexto,” which is a Mexican twelve string guitar. Today most conjunto bands use electric bass instead of the tololche, but the bajo sexto and the accordion are a must. 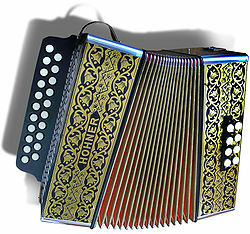 Using the dynamic combination of the bajo sexto and the accordion as a launch pad, conjunto bands on both sides of the border confidently combined Mexican ranchera-style vocals and the lyrics of corrido ballads with the music for German dances such as the redova, the schottishe, the mazurka, the waltz and the polka. Later in the 19th and early 20th centuries waves of Polish immigrants moving into the Mexican state of Sinaloa and Czechs immigrating into Southern Texas solidified the Mexican/Central European dance connection. his Texas Playboys. They were also submerging themselves in blossoming genres like country, blues, European fiddle music and swing. All this musical exploration helped inspire Martinez to depart from traditional German accordion techniques and develop a prancing style that allowed him to focus on creating melodies while his musical partner Santiago Almeida played the bass notes on the bajo sexto. Martinez’s style became a staple of the genre; the cascading accordion defines conjunto music today. In the 1960s, as we’ll learn below, conjunto fused with Mexican Orquesta music and then with modern genres like blues, jazz, rock and pop, to form an increasingly popular genre known as “tejano.” The fact that there was now a “progressive” offshoot of conjunto music allowed traditional conjunto ensembles to embrace the old standards. Mexican-Americans of all generations to honor their collective struggles, share a collective nod to the past, and then dance dance dance.